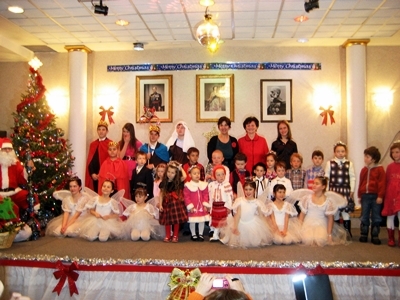 The cultural-artistic, historical and commemorative events plus the Annual Christmas Shows by the children of our parish take place in the hall known as "Dacia" Hall. This hall has been completely renovated between 1994 and 1996, based on a project by architect George Coica from Toronto through volunteer work from our faithful members under the supervision of Father John Bunea and of Mr. Dan Chirtu and Mr. Peter Dalea as presidents of the Parish Council. Wallpapers, roof renovation, installation of decorative columns, chandeliers and installation of new windows, full kitchen renovation, granite flooring and installation of a permanent scene, make "Dacia" Hall a pleasant environment for the meetings of the members of this parish. As mentioned above, church celebrations dedicated to Curch's Day, to Romanian Principate's Union Day on January 24th, to the Day of Unification of Basarabia with Romania on 27 March, to the National Day of Romania on December 1, and numerous other banquets, performances, parties and New Year's Eve celebrations, organized by the Parish Council, Dacia Association, Lady's Committee and Seniors' Association, on behalf of the Church, are part of the St. George Romanian community's live in Toronto. Add to this the delightful Annual Christmas Shows organized by the Sunday school students coordinated by Mihaela Bunea, the priest's wife. 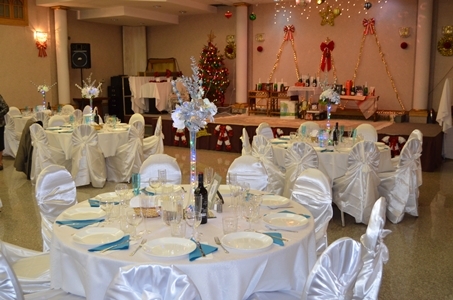 Dacia Hall can be rented on favorable terms for members of the Romanian community in Toronto for community or family events: weddings, christenings, birthdays, conferences. Hall capacity is 200 people. For events involving dancing we recommend booking for maximum 160-180 people. There are two alternatives for renting. The first alternative includes only the room and the furniture. The second alternative includes the decorated room, à la carte menu prepared by a professional chef and bar. For reservations and further details please contact Father John Bunea at tel. 905-770-8529.